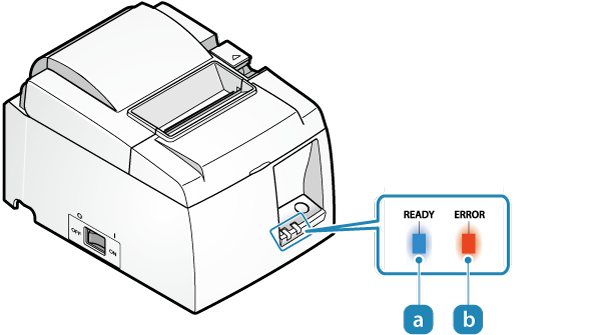 The Ready LED and Error LED will let you know the status of the device, for instance if it is in the ready status, and also if an error occurs (for example if the printer is out of paper). Power is on and the ready status is enabled. Connection between the printer and the destination network device (for example a router/hub) was disconnected. Check and make sure that the LAN cable is properly connected. The IP address cannot be obtained. If a DHCP server is used, check operations of the DHCP server. If a DHCP server is not used, set a proper IP address. Error indicates it will move automatically to normal usage because the error status has recovered. Since the printer head temperature is high, printing has stopped. When the printer head temperature returns to a normal range, printing will resume automatically. Since the substrate temperature is high, printing has stopped. When the substrate temperature returns to a normal range, printing will resume automatically. Error indicates that normal usage is possible if paper is replenished or when cover is closed or such steps are taken. The printer cover is open. Set the paper, close the printer cover, and it will move to the ready status. The cutter did not operate properly. If a paper jam is happening, remove the paper that is causing the jam after turning off the power, and move the movable part to the home position by referring to Cutter Lock. If the same error is displayed even after the movable part is moved, contact the seller. Try turning the power off, and then on. If the same error is displayed even after the power is turned on again, contact the seller. Supply of power is not consistent. Or, abnormality has been detected for the power unit. Try turning the power off, and then on. Try changing the location for the electrical outlet and turn on the power again. If the same error is displayed even after the power is turned on again, contact the seller. An abnormality has been detected for the printer head thermistor (temperature sensor). An abnormality has been detected for the Basic Board thermistor (temperature sensor). An access error has been detected on the EEPROM. An access error has been detected on the CPU internal RAM. An access error has been detected on the RAM.